The Asscher cut diamond is an old cut style with a simple facet structure. Those who prefer a distinct geometric look to a ring are attracted to this cut. The asscher cut is particularly suited to Art Deco ring designs, because of this geometric look. The larger, simple facets of the Asscher cut produce bigger flashes of light, so it is not as glittery looking as some other cuts. This is part of the appeal to those who like this cut. If you would prefer a diamond that has a big show with lots of flashes of light on the finger then this cut type is probably not for you. Asscher cut diamonds are excellent value because they are a relatively low cost compared to the more popular round diamonds and for the person who likes simplicity, elegance and an old fashioned cut type, it can be a great diamond choice. Asscher cut diamonds can be used in many ring styles and settings, such as the ever popular halo cluster. Asscher cuts also look great in solitaire rings with side diamonds, or even simply on their own with no additional diamonds. Quite a few engagement ring designs are represented in this section. Of course many possible design options can be made with this cut as the feature diamond. 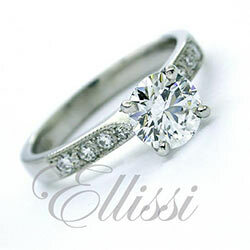 As we are custom ring makers, you are not limited to only the designs here on this page. “Lavina” Asscher cut diamond ring. “Amelia” Three-stone Asscher cut diamond ring. “Gratia” Asscher cut diamond in a double claw basket. “Ambrosia” Asscher cut diamond cluster ring. “Antonia” Asscher Cut halo with diamond set band. “Eva” Asscher cut diamond halo cluster ring.